Experience spiritual calm with the first adult coloring book to focus on the Rosary as you color and reflect on the traditional Catholic prayer. Renowned artist Daniel Mitsui provides exquisitely detailed illustrations of the Glorious, Joyful and Sorrowful mysteries, suitable for meditative coloring and for reflecting on the lives of Jesus and the Blessed Mother. Adult coloring books were the fastest-growing book category in recent years. But of the hundreds of coloring books on the market, very few reflect Catholic themes. Daniel Mitsui's The Mysteries of the Rosary is the first adult coloring book to focus on the Rosary and draw inspiration from medieval illustrated manuscripts. Just as repetition of the Hail Mary during the Rosary can create a contemplative awareness of its mysteries, careful attention to coloring these captivating illustrations can open your heart to a deeper awareness of the Roary's truths. Like the medieval monks who understood their artistic decoration of the gospels as a form of prayer and praise, you'll find yourself caught up in meditative wonder as you prayerfully color Mitsui's images. The artist specializes in hand-drawn ink illustrations on paper or vellum. Since his conversion to Catholicism in 2004, most of his pieces have focused on religious subjects. Matsui decided to publish selections of his fine art as a coloring book because he believes that traditional Catholic art has the power to shape the imagination and heart of everyone who experiences it. 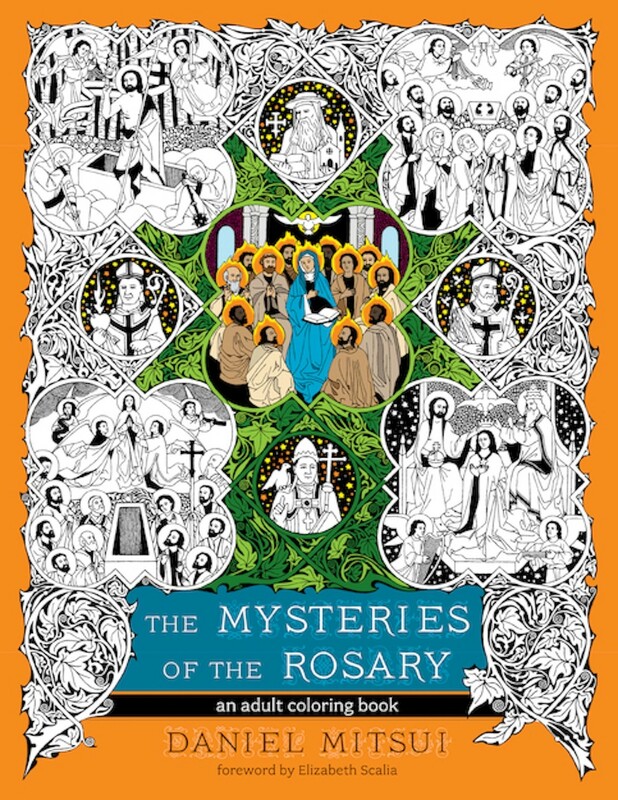 This unique coloring book contains thirty illustrations - fifteen full-page drawings of the mysteries of the Rosary, each one beautifully bordered by traditional images of animals and flowers; twelve vignettes featuring prophets, evangelists, and Fathers of the Church; and three larger drawing with the artist's commentary. It also contains description copy written by the author for the three sets of Mysteries. This is the first adult coloring book to draw from the tradition of the medieval illustrated manuscript and to focus on the Rosary. "Daniel Mitsui’s beautiful renderings are sure to inspire the mystic artist hidden inside all who use this inspiring coloring book." “It is very easy to fall into prayer while working on these images." "A deeper meditation on the holy Rosary." "Influenced by the religious art of medieval Europe, when Gothic art was created according to Catholic principles, Daniel Mitsui honors God and the Blessed Virgin Mary with these traditional images. Designed in his signature style, these detailed coloring pages will encourage a deeper meditation on the holy Rosary." "A powerful portal into creative meditation." "Daniel Mitsui’s images offer something new while remaining rooted in timeless ideals." "A treasure of the Church." "Daniel Mitsui is a treasure of the Church."